A gold star in front of the name indicates it is one of these grand fellows who have gone before us to "That beautiful land of the big track where the groove is 20 feet wide, no dust or rain outs, where there are no fouled plugs on the starting line and the motors always start with a short ten-foot push." 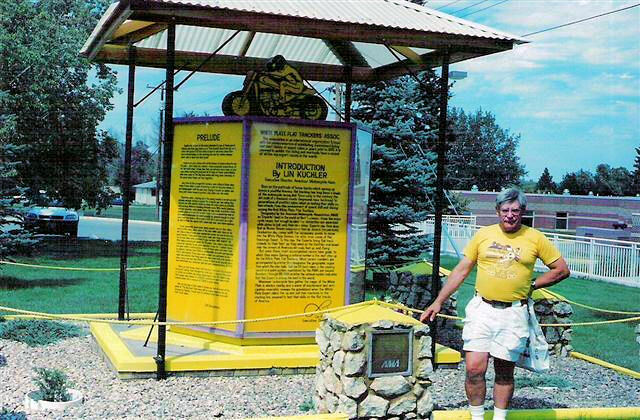 I have been very active with all phases of motorcycling for over 50 years, 39 of those as a dealer. I have personally known many of the flat track riders. I know also that you will have some tears in your eyes when reading the attached list of many of those grand fellows who have gone to The Big Track which will bring back memories of the great good times we had together. Very few of the younger flat trackers were riding in those days when it was either a case of winning a part of the prize money or eat hamburgers until the next race, hoping it would be better and then with some money in pocket, a big steak was the order. Remember when. Starting out in the spring (usually in an old car) with probably enough money in pocket for a week's gas and eating, they started out with plans to enter as many dirt track meets as possible, with no long distance traveling between races. With careful planning and luck (possibly some dealer along the way would contribute a badly needed piston or a new tire or rear chain. If you could win the final on his brand of motorcycle he would be pleased enough to shake your hand and leave a $10 or even a $20 bill in your hand) you might be able to finish the season with some cash over and above expenses. I have personally given some badly-needed help to a few riders who, in a few years, were some of the best white plate riders on the dirt. One or two of them even earned the number one and all were very good friends. I have given tires, chains, small and large motor parts to out-of-luck riders who promised to pay me later -AND ALWAYS DID. After being a motorcycle dealer for 30 years I can make a claim which can not be matched by any other merchant in any city - I cashed checks and gave credit to motorcyclists during all those years and when I sold my agency I had less than $500 in uncollectable accounts and less than $50 in bad checks. Those guys were number one customers to me. I might also mention that those were the days when total prize money at many races was less than $500. I have on hand an old race bill which was advertised as a national half-mile with total prize money of $550. I felt sure that those older flat trackers had more fun, enjoyed living and racing - even though they often had to sleep in a haystack or curled up in a little car, eating hamburgers - the present -day flat tracker who travels in a $15,000 motorhome and rides in the events which lists a minimum of $3,000 in prize money. My one big hope is that, when it comes my turn to knock at the gates of "The Big Track," there will be a place reserved for me among my friends. I could ask for nothing better than to be with them once again.